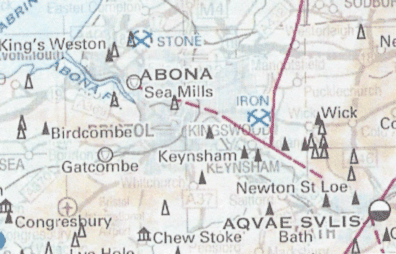 There is much evidence of a Roman Road that ran between Bath (Aquae Sulis) and Caerwent in South Wales and that the Romans probably built two stations between these at Sea Mills (Abona) and possibly at Bitton (Trajectus). The road probably crossed the neck of land between Lansdown and Kelston Beacon and after passing a camp at North Stoke descended to Bitton. After leaving Bitton it is thought that the road followed the course of the old Bath to Bristol highway through Hanham passing over Ashley Hill to Redland, Durdham Down and to a large Roman settlement at Sea Mills. From this site, which they called Abona, Roman galleys would have crossed the Severn estuary. It is unlikely that the route from Bath took the Romans along what is now the A431 because this would have been a flood plain area around Swineford. There is a strong case that the route from North Stoke was along an ancient roadway known as ‘sunken road’. There is no evidence of a Roman town at Bristol, but our neighbouring cities Bath (Aquae Solis, Cirencester (Corinium) and Gloucester (Glevum) were flourishing places at that period. So perhaps we should be calling Bitton the name Trajectus, which means a bridge or crossing place. However it is not know what was crossed at Bitton. It didn’t cross the river Avon, but from the distance of 6,000 paces, which the Romans recorded, we can state that it was in the vicinity of Bitton and perhaps crossed the River Boyd or an Ancient Briton road going north-south, in the vicinity of Barry Road. A large number of other Roman remains have been found in the parish of Bitton at various times, including four Roman villas. In St Mary’s Church Roman bricks were found in the Norman masonry of the western wall of the nave. 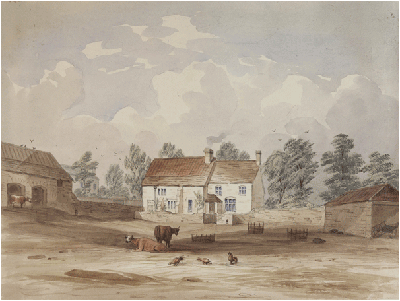 In the Domesday Book, at ‘Bertune’ there were 5 villeins , 2 bordars, 4 slaves and 10 acres of meadow (a villein was a villager who rented land and was tied to the lord of the manor; a bordar was a peasant of a lower class, probably with a cottage but very little land; a slave was entirely bound to the lord). At the time of the Norman Conquest the land was held by the Saxon lord, Dons. In 1151 the manor of Bitton along with a number of estates came in to the possession of Robert Fitzharding. Some time later the land was enfeoffed (given in exchange for their pledge of service) to Robert de Amenevill. 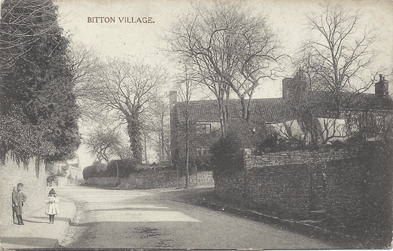 Adam de Amenevill was given the rights to the manor of Bitton by Henry II, ‘at the service of a knights fee’. Adam had two sons, both named Robert – one of the Robert de Hanham had land at Hanham and the other Robert de Bitton held the Bitton estate. Robert of Bitton had two daughters, each named Petronella. The eldest had a daughter who was also named Petronella. She married David le Blund or Blount. The other daughter of Robert de Amneville (the younger Petronella) married Nicholas Oxenhaye, who held the manor of Oldland. A charter from Henry III in 1230 granted the right for a market to be held every Tuesday in Bitton. This was part of the rights granted by the King to William de Putot who owned part of the manors of Bitton and Mangotsfield. William, who was born in Bitton, later became Sheriff of Gloucestershire and then Mayor of Bristol. There is evidence that earlier than this in 1220 Robert de Amenevill (William’s father-in-law) had paid for the right for a market but had not held the market. 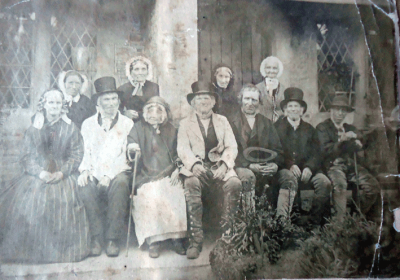 The right to hold a weekly market in Bitton was recently highlighted when one of the documents which had been held at St Mary’s Church was kindly translated by Dr Frank Thorn at the request of Gill Greef. The main part of the translation is shown below and is one of the important documents relating to Bitton which can be found in the second volume of HT Ellacombe’s History of Bitton Parish. Henry by God’s grace King of England etc [gives] greeting. You should know that we have granted and by this charter of ours have quitclaimed [i.e. released] on behalf of us and our heirs for the benefit of our well loved and loyal William de Putot and his heirs forever the 20 shillings which were normally giveneach year to the constable of Bristol from his [i.e. William’s] land of Mangotsfield under the heading of jaresiua. We have also granted and by this charter of ours have confirmed to the William just mentioned that he himself and his heirs should have one market forever each week for the whole of Tuesday at his manor of Bitton, unless etc. Therefore we desire etc. for ourselves and our heirs that this same William and his heirs forever should be released from giving the 20 shillings just mentioned each year to the constable of Bristol just mentioned in the name of jaresiua as [has been] just mentioned. And that this same William and his heirs should have the market just mentioned each week for the whole of Tuesday at his manor of Bitton happily and in peace, freely and quit [of all obligations] and wholly and with all the freedoms and free customs which belong to this type of market as has just been mentioned. The Meadows, which consisted of Mickle-Mead, Eden’s Field, Sydenham Mead, Holme Mead and Hanham Common were enclosed in 1862, restricting the rights of everyone to graze livestock on common land. The reasons for the enclosure given in the legal application was that the ‘meads’ would be more productive and in the case of Hanham Common that it would ‘do away with the haunt of disorderly persons’. Such enclosures helped lead to the impoverishment of many country people, making them landless labourers. A custom held before the land was enclosed was known as Shooting the Meadows or Holme-Mead Revel or Meadow Sunday. On these meadows which skirt the river Avon between what at that time was Hanham Mills and Swinford Mills people were allowed to use the land to graze their cattle. However this was only after August 14th, when the grass was cut. The ceremony was opened by a man leading a white bull, decked and dressed, through the gate of Holme Mead after which all the other cattle were driven in a rush, with shoutings and hallooing of the most uproarious kind. The ceremony was later moved to the east end of Mickle-Mead, at Swineford. The white bull and parade had disappeared by the time that this was reported in the Bristol Times of August 22, 1846, but the main custom and rights were retained. Everyone used to crowd from the neighborhood to witness the sight; tents were erected; and music and drinking and sometimes fighting went on for the whole day. Rev. H.T. Ellacombe wrote to correct the newspaper on the details. The first milking took place very early on Sunday, or even at midnight on Saturday, and the first to carry this out was considered to be the King or Queen of the Meadow for the year. It was a custom for the owners of certain manors to lead a white bull (or a horse with a white sheet over it) or a black boar or a black stallion; after which, those who had rights, turned in their cattle. The Abbot of Keynsham, to whom the meadows once belonged, had an obligation to provide such male animals for the public good. Two centuries earlier, in one of these meadows, Sydenham Meadow, the unfortunate Duke of Monmouth and Lord Grey with a rebel army of 1000 horses and 8000 foot soldiers encamped 25 May, 1685. On the same day they had a skirmish with the Kings Dragoons and got the worst of it – a foretaste of their total defeat at Sedgemoor twelve days later. Bitton has been an industrial village for more than three centuries. The site now known as the Intier site and scheduled for housing development was previously a site for manufacturing car components, which started when Pressed Fibre Limited produced seats from moulded wood pulp for the Morris 1100 car. During this time the site was redeveloped to the current layout and the former mill pond, once known as ‘Sopers Pool’, was infilled in two phases. Magna (Intier) then bought the site in 1985 and by 1999 were producing plastic mouldings used in cars such as Ford, Jaguar, Rover and Saab. 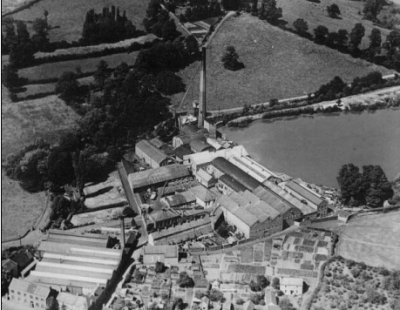 But it is really as a paper mill from 1825 to 1961 that the works had a significant effect on Bitton. The photo opposite shows the paper mill on the day it closed down in 1961. Ray Coles, whose father Ted was there, also remembers John May, ‘Jessie’ Jenkins and Bill Bishop. At the end of the nineteenth century about 400 people were employed, making writing paper and envelopes, some for the Government. The main jobs were rag sorting, rag cutting and paper cutting. The paper making process involved boiling rags with bleach and lime before being shredded into pulp and then pressed and rolled. After the mill burnt down in 1843 it was sold to William Sommerville, who had the works rebuilt and enlarged and built a house in five acres of gardens, ‘The Lons’. Sommerville sold the mill to the King-Smith family in about 1900. Until 1932 the mills generated the electricity supply for the village. The redbrick ‘Dacora’ office block fronting Bath Road and the adjacent industrial buildings fronting Mill Lane were part of the ‘Phoenix Works’ of Torrance and Sons. Before being a paper mill, it was a brass works, started by William Champion in the early eighteenth century to extend his plant at Warmley. Workers were recruited from the ‘Flanders’ area between Belgium and Germany, skilled in the process for smelting. Hence we still have many unusual local names such as Ettel and Ollis. 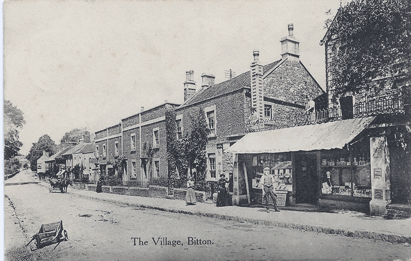 Three centuries of manufacturing on the site made Bitton an industrial village, where paper-making was of much greater importance than its agriculture. There are three possible explanations: for the origin of the name ‘Bitton’ – ‘Boyd Town’ after the river, ‘Bertune’ as listed in the Doomsday Book, or ‘de Bitton’ from the family. Boyd Town – from the river The name Bitton could be a corruption of Boyd Town after the river Boyd that runs through the village. The suffix -ton meant settlement in much the same way as did -wich, -ham, -by, -thorpe and -stoke. This explanation is supported by H.T. Ellacombe who provides a reliable source for much of the history of Bitton. Bertune – as in the Domesday Book ‘Bertune’ is recorded as the village name in the Domesday Book. Bertune or Barton or Barten as in King’s Barton in Bristol refers to a piece of farm land enclosed for a purpose or to the demesne lands of the manor. Over time this name may have been corrupted by local dialect to become Bitton. 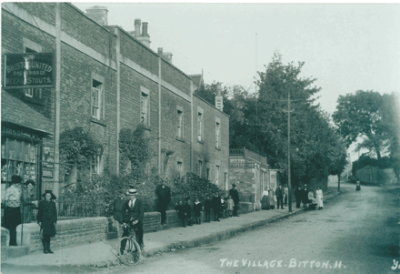 From the ‘de Bitton’ Family Name it’s easy to assume that the village was called after the ‘de Bitton’ family. One of the two coffin lids found in St Mary’s Church has an effigy of the knight ‘de Bitton’. His shield bears a fess (or band) of broad red, across the centre, which is consistent with that of the d’Amneville family, who came over with William the Conqueror. Adam d’Amneville was granted the local manor by Henry II in the twelfth century for a ‘knights fee’. He had two sons Robert de Hanham and Robert de Bitton, which suggests that they took their name from the area rather than the area being named after them. The church dates from Norman times but was built on the site of a saxon church. In Saxon times Bitton was probably the minster church for the Upper Langley and Swinehead Hundred – it was much larger than a normal parish church and at Domesday it had an endowment of one hide, a normal feature of minsters St Mary’s had a huge ecclesiastical parish extending in the rely nineteenth century as far as Kingswood (see separate page St Mary’s Church) Two of the vicars, both father and son have had a great impact on the history of Bitton. The father, H.T. Ellacombe, curate and then vicar 1817 to 1850, rebuilt St Mary’s and built three new churches in the parish. He later wrote the History of Bitton Parish (see separate page for Sources) as well as a number of works on campanology. He also became famous as the inventor of the Ellacombe chimes, a means to enable one person to ring the church bells. His son H.N. Ellacombe, vicar from 1850 to 1916 was a famous gardener, publishing many articles and books on gardening. 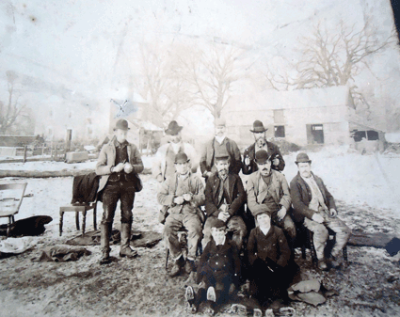 Schooling in Bitton was sadly lacking in comparison with local areas in the nineteenth century. 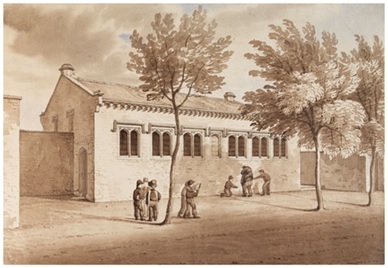 The first day school was set-up just for boys in 1831 (girls were barred) – Bitton National School for Boys which is now called St Mary’s Church Hall used by Bitton Pre-School. 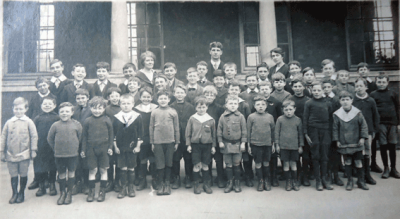 The pupils (aged between 5 and 12 years) were required to attend every day, except Saturday which was a holiday. They also had to attend church services on Sundays in both the morning and the afternoon. It was a fee paying school – the entrance cost was 6d, reading 2d, reading and writing 3d, with reading writing and ciphering at 4d. The school was inspected in 1844 by the equivalent of OFSTED and found to be wanting: ‘Children of the first class did very well but there was room for improvement in all the rest.’ The recommendations included procuring a blackboard, slates, books, maps, a long writing desk against the wall, cupboards and good ventilation. In addition it recommended that the teachers, Mr. and Mrs. Bryant, should be sent for a month’s training at the London Central School. Shortly after he became vicar in 1850, Canon Ellacombe made an unsuccessful appeal for the wealthy of the village to contribute to a new school because of: ‘…the great ignorance in which a large portion of the children of this parish are sunk. I speak now solely of the hamlet of Bitton (including Swinford, Upton, and Beach), and almost solely of the boys. The girls are not much better, yet their condition is somewhat better than the boys, and is in a fair way towards improvement. Of the boys I can scarcely speak too strongly. Their ignorance and idleness is most deplorable their manners are rough and uncouth in the extreme.’ The first school open to girls was Bitton Boys and Girls National School, in the same building in 1876, but this was still at first fee-paying and opened as a result of the Education Act of 1870. Pupils had to bring twopence each, every Monday and drop it into an oak table with a slot, which is possibly the table now in St Mary’s church. The vicar, Canon Ellacombe, would oversee this and take scripture lessons. Repeated entries in the school log show that many children were absent probably because the families had no money. An entry on December 21st 1876, by Miss Mary Cullen the headmistress, states ‘only 25 children present this morning, the rest collecting gifts on St. Thomas Day, according to an old custom.’ This is remembered as ‘Gooding’ when children would knock at doors in the village saying ‘Please, I’ve come a-gooding to buy my mother a Christmas Pudding’. Bitton compared badly for education with other local areas. This first public school in Bitton came over 120 years after a free school was opened in Kingswood by John Wesley in 1748 for the children of local colliers. The first school in Keynsham (fee paying) was in 1705. 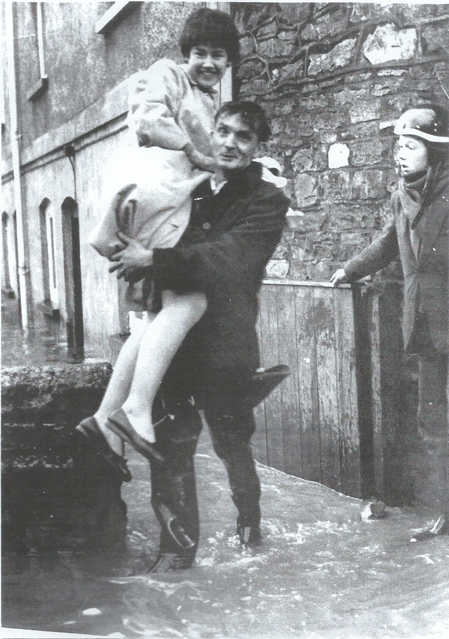 Girls faired especially badly in Bitton compared with many towns and cities. As an example in Keynsham, the National Day and Sunday School accepted Girls in 1823. A new School, Bitton Council School (now The Meadows) was built and opened on the 4th April 1910, with 89 children. The first head was Mr Sydney Miles and from 1918 – 1944 it was Mr P. Cherry. 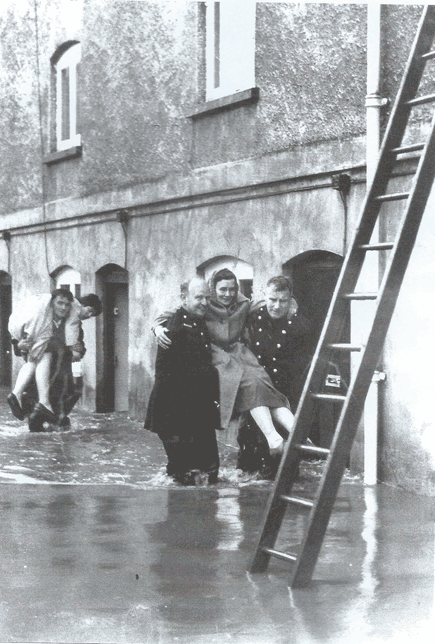 The Great Flood of 1968 was a disaster for many in Bitton and the surrounding areas. On Wednesday 10th July the rain had been falling in torrents for most of the day and by the evening thunder and lightening heralded the extent of the calamity. In the worst rainstorm for half a century, more than five inches of rain had fallen in less than twenty-four hours, leaving parts of Bitton flooded. In the High Street the water was six feet deep, flooding many buildings and also the cottages in Mill Rank. The River Boyd broke its banks, washing away the parapet of the bridge near King’s Square. Fire Brigades from Bristol and Bath came out to help rescue residents from their houses on the High Street. Night-shift workers had climbed on to the roof of their factory to escape the rising waters. Fortunately, William Preece of Oldland Common had a motorboat, which was used to rescue some of the trapped people including the factory workers. Warmley Rural District Council sent an emergency team to work throughout the night under the leadership of Mr Edwin Smailes. He was unfortunately injured later on and taken to Cossham Hospital. Police Sergeant Trevor Sweetland of Oldland Common, dived fully clothed into the water to help a swimming man reach the rescue boat. The crew of the boat anchored it to a lamp post to stop it being swept away in the swirling waters.